Having a second child might be one of the few “second” experiences in life where instead of it feeling like you’ve been-there-done-that, you feel the terror of blasting off to a whole new world. Not only because you now have to figure out how to juggle two tiny minions, but because this is the first time your first child won’t be your only child. And while he may love that later in life, you can bet there will be a period of…*ahem*…adjustment..
As you prepare for “launch,” it is important to be intentional in the way you talk about and prepare for the latest addition and Big Brother’s (or Sister’s) new role in the family. If you start getting “mission ready” early, you’ll train yourself to handle the hard situations to come, so you can maintain your cool despite the lack of sleep. Unsure of where to begin that training process? Thankfully, you don’t have to boldly go where no (wo)man has gone before. Nope! Lucky for you, we’ve gleaned the wisdom of the ages and packed them into these 7 important steps to help your old baby learn to love your new baby. Let them be your guide to the stars as you jump start sibling bonding and ease the transition of adding a second child in your home. While you have been thinking about that second child for quite some time, chances are your little guy has been blissfully unaware. Talk about the new baby early on in the pregnancy. Share why growing the family is a good thing and how much more love there will be to go around. Explain what Big Brother’s new role will look like (while letting him know just how great he will be at it). Involve him in the change. Let him help decorate the baby room, pick out registry items, suggest a “going home” outfit, or brainstorm names (though be graceful when turning down “Donut” – and don’t be surprised when it starts sounding catchy after the thousandth time). As time can be a difficult concept for kids, and because waiting is hard, you can help explain the upcoming change by using holidays or seasons (e.g. “After Christmas!”). Snuggle the Baby by Sara Gillingham, is a fun, interactive book with moving parts that lets your son practice and play with his own baby. Heather Here: A friend of mine recently introduced me to a new book called 9 Months: A Month-By-Month Guide to Pregnancy for the Family to Share. It’s another really great way to get your firstborn excited about the coming sibling! While you are checking off all the baby lists, make sure you are also checking in on your first baby. Remind her how special she is to you and how much you anticipated her arrival too. 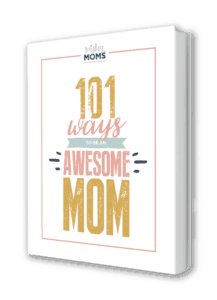 Make a photo book of her baby pictures and reminisce about how happy you were to add her to your family, her milestones, and how proud you are of the big kid she has become. Be creative with excuses for not doing things and find alternative activities when you can’t seem to get up off the couch. If you use the baby as the reason you can’t go do anything, she may grow to resent the baby. As the due date slowly creeps up, everyone in your family will become acutely aware that this is the last time your family will be just as it is. Take a break from baby planning and revel in that moment for just a bit. Set aside an evening or a whole day just to hang out together. Go on a train ride around town. Play classic games like Frog Hoppers or new favorites like the Sneaky Snacky Squirrel card game that are sure to elicit giggles and fond memories. Break out all the kiddie instruments and hold a jam session to your favorite playlist. Has he been begging you to have a picnic lunch at the park? Do it! This will help your little one to remember that, while there has been a lot of talk about and prep for the new baby, he is still an important member of the family. You’ve hit the final countdown! All your bags are packed, you’re ready to go. Why not also pack a little surprise something for your kids? For many children, gift giving is a simple, tangible expression of love. Pick up some gifts that the new baby can “give” your son when he gets to the hospital. Find toys that will work well (and quietly) in small spaces for play in the hospital room. On the flip side, have your son pick out a gift for the baby that he can give when they first meet. Even if the baby doesn’t exactly need the new Paw Patrol potty seat (and gosh, wouldn’t she love to share it with her big brother? ), it means everything for it to be HIS idea. You can also get gifts for both from you (like cute matching shirts that announce their new sibling status). While you are “having fun” at the hospital during liftoff, plan a special time for her too! Whether she will be staying with friends or family, make plans for them to go to a splash pad, a children’s museum, or a play place like Monkey Joe’s. This way she has something to look forward to and won’t feel like she is missing out. And, even better, she will have something to share with you when she finally joins you in the hospital. It’s time to put all those lessons you learned from the “Big Sister” books to use. Let her have real face time with the baby and some special cuddle time with mommy and daddy. Ask her to help you with little things like getting you a diaper or pushing the stroller. Praise her for entertaining the baby while you change him. If you pump or use formula, allow your daughter to “go for bottle up” and feed the baby. Let her give mommy and baby a gentle (and closely supervised!) check-up with a just-her-size doctor coat and medical kit. Let her lead as far as how much she wants to help or doesn’t. Praise her involvement when she’s excited to play a role, but otherwise, encourage her to play and carry on as she normally would. Every space shuttle feels tremendous heat upon re-entry. Bringing a new child home is no different. Whatever emotional rollercoaster you are on, you can bet your toddler is on one too. One day might be amazing; the next, he might be feeling “Max Q” – where the pressure build-up is so great he can hardly function. Recognize that he will say things he doesn’t fully understand (or mean) and don’t jump to anger. Say out loud what he is actually feeling and teach him how to work through it. Kids are not born with coping mechanisms; parents have to help them figure out the right way to handle things. Give grace for jealousy, and don’t scold him for what he is feeling. Let him know you understand and that it is hard for you sometimes too. Remind him you love him just as much as ever. If he is intentionally hurting the baby (either overtly or in a too-hard grip), calmly call him out on it right away. Remind him that little sister thinks the world of him and also needs him to look out for her. Once you have everyone under the same roof, all your work should have laid a good foundation for your son to begin to see the new baby as a part of the new “us” rather than “me vs. them.” It’s a framework for him to begin to understand his whole new world in the days, months, and years to follow. Praise him for being the big helper he is, and thank him when he is being sweet. Smile and give hugs when you see your toddler enter the room. It may sound simple, but when you are exhausted, it can be hard to remember. And, right now he needs to be assured you still love him too. Set up special one-on-one times with mommy and daddy and give him “Big Brother” privileges like staying up a little later one night a week and playing games. You did it! You completed your mission and are now adjusting to your new normal. You’ve engaged your first child in your latest journey, helped give voice to her new feelings, set aside special time for just her, and given her the friend of a lifetime. Of course, adapting to a new baby is an ongoing thing, not a one-time accomplishment. Every few weeks, have an intentional debrief with your family. Pat yourself on the back for being awesome. Hopefully this 7-step manual will help give you a successful launch and reentry as you prepare for this new life-long mission. What other tips and tricks have you tried for introducing siblings? What has worked for you or others you know? Launch references are thanks to Josh McConkey, who worked on the Discovery space shuttle and got to be in the Control Room for launches, and who is a super dad in his own right with his amazing wife (and truly Mighty Mom) Jen. Karen is a mother of two, wife to Matt, and a recovering lobbyist trying to find her sanity living in (sometimes) sunny Florida. Since having kids, Karen has run the gamut working in an office full-time, part-time, and no time. The things that keep her going at 3am are God, her family, friends, and coffee. And sometimes a book, because once she starts reading a book she can’t stop. It is a problem. Seriously. She loves to visit the theme parks, make banana bread with her daughter, chill with family and friends, and sleep.